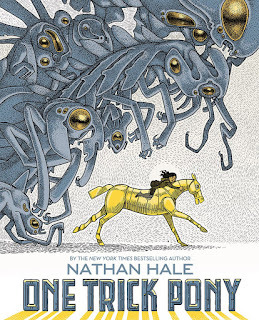 Nathan Hale has many fans who love his blend of adventure and history in graphic novels. In his newest graphic novel One Trick Pony, he ventures into completely new territory with a futuristic post-apocalyptic world. It's full of exciting, inventive adventure that will be perfect for many repeat readings. Hostile aliens have devastated Earth in search of technology, hungry for electricity and any machines that feed on it. When Strata and her friends stumble upon a cache of robots, including a super robot pony, they set off the sensors of these aliens. Strata and her family are digital rescuers who are trying to keep the memory of civilization alive by seeking out and safe guarding old technology. "'We're doomed!' 'Bubbles! They're here!' 'Pipers!'" Determined to protect her family and friends from the wrath of the alien Pipers, Strata leads the aliens on a wild chase in this fast-paced sci-fi adventure. I'm looking forward to rereading this, thinking more fully about the distinct characters and themes. But in the meantime, the sense of Strata's courage and mission will keep me going. Enjoy this preview from Google Books to see how quickly the pacing of this story starts off. 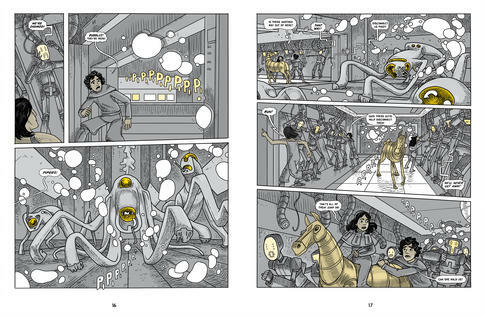 By pages 20, the chase is on as Strata's pony helps them escape the clutches of the Pipers. The review copy was kindly sent by the publishers, Abrams Books. If you make a purchase using the Amazon links on this site, a small portion goes to Great Kid Books. Thank you for your support. Many young readers are worried about how they'll find friends and if they'll need to change in order to fit in. In Star Scouts, Mike Lawrence creates a fun new twist to this when his main character finds it easier to make friends among a goofy group of aliens than she does in her new school. This is a graphic novel that's sure to have wide appeal and a terrific heart, one that I hope finds its way into many readers' hands. Avani Patel is having trouble in her new school, but life becomes much more interesting when she's abducted by a cheerful blue alien named Mabel. 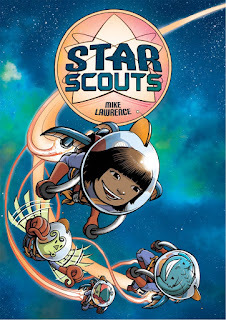 Avani joins Mabel’s group of friends in their Star Scouts troop as they earn badges in teleporting, jetpack racing and “xenoscatology” (yep, identifying alien poops). Kids will love the adventure, humor and especially Avani’s spunky character, as she discovers that she doesn’t have to fit in to find friends. I really love the message in this--that friends come in all shapes and sizes, that they have fun together being silly and having adventures. The review copy was kindly sent by the publishers, First Second and Macmillan. 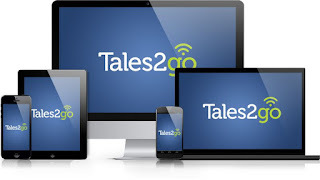 If you make a purchase using the Amazon links on this site, a small portion goes to Great Kid Books. Thank you for your support. Like our animal cousins, young children practice all sorts of skills through play. This powerful picture book takes readers to a refugee camp in Tanzania, where we see how playing soccer helps kids move through their trauma to connect with one another. This is a story that will lead to important discussions about refugees and also about the power of play in everyone's lives. Young Deo had to flee from his hillside farm when the war came, losing his family in the chaos of that dark night. He traveled for weeks alone, finally making it to a refugee camp in northwest Tanzania. "one dark night his family was forced to flee their hillside farm"
Deo begins to rebuild his life, but he keeps to himself. 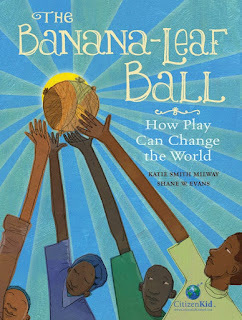 He makes a soccer ball from dried banana leaves like his father did, but a bully called Remy and his friends steal it. Remy's gang steals food, pencils, toys from other children. "But when food becomes scarce or water runs dry, flights break out. Some boys form gangs to get more food by stealing from others, even though on one has much." When a coach invites Deo to play soccer, he wants to join in--soccer was one of his favorite activities at home. The coach assigns Deo and Remy to the same team. Through their play, they begin to forget about their anger and laugh together. This is an important, hopeful book to read together with children, whether as a family or in a classroom. 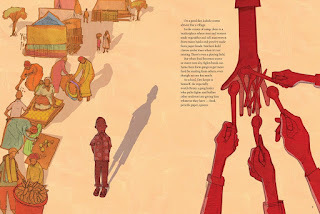 A picture book, especially one that is both hard-hitting and hopeful like this, can provide a perfect starting point for talking about social justice issues of refugees. 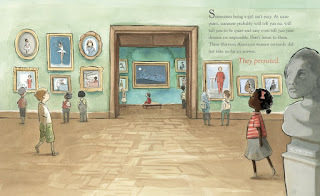 It not only can create a sense of empathy, young readers from many places will relate to the power of play. Definitely share the author's note and backmatter with children. You'll meet the inspiration for Deo: Benjamin Nzobonakira who survived fleeing civil war in Burundi and lived as a refugee in Congo, Rwanda and Tanzania. Information about the refugee crisis, games that build trust and inclusion, and the Right to Play, a play-based nonprofit organization focused on tolerance and peace. The review copy was kindly sent by the publishers, Kids Can Press. If you make a purchase using the Amazon links on this site, a small portion goes to Great Kid Books. Thank you for your support. Imagine all the adults in your life suddenly disappear. Isn't that every teen's fantasy? Leave me alone. I know how to take care of it all by myself! That's where Gone starts, and oh what a ride it is. I highly recommend it to any teen who loves science fiction--my only caveat is that it's a long book, so you have to be ready to dive in. 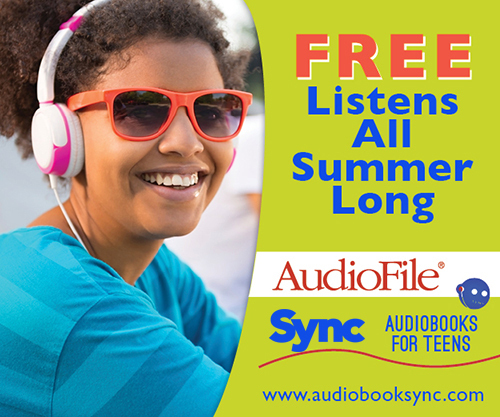 Starting today, Gone is free through SYNC Audiobooks for Teens. SYNC is a free summer audiobook program for teens 13+. 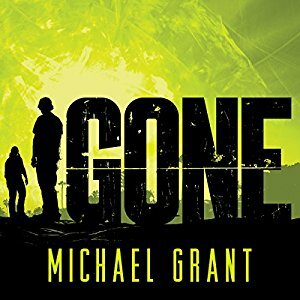 Gone will be available July 20-26th through the Overdrive App. Gone sucked me in from the very beginning. I was caught - completely immersed in this imaginary world where the kids are in charge. The grownups have all completely disappeared. The kids who are 13 and 14 are the oldest kids around, and so have to start figuring things out. What do they do with kids who are hurt? What about the daycare center full of babies and toddlers without any teachers? What about the kids who are raiding the grocery stores? The excitement quickly turns to fear as a fire starts in a building near the daycare center. The kids soon realize that they are completely by themselves without computers or cell phones, and without any sign of rescue. They are trapped inside a force field barrier that surrounds the town, and whatever caused this is also causing mutations in birds and animals - along with some strange powers in some of the children. I originally read Gone 8 years ago, and the excitement has stayed with me. I'm looking forward to listening to this again. Make sure you download your copy between July 20-26 through the SYNC website and the Overdrive app. 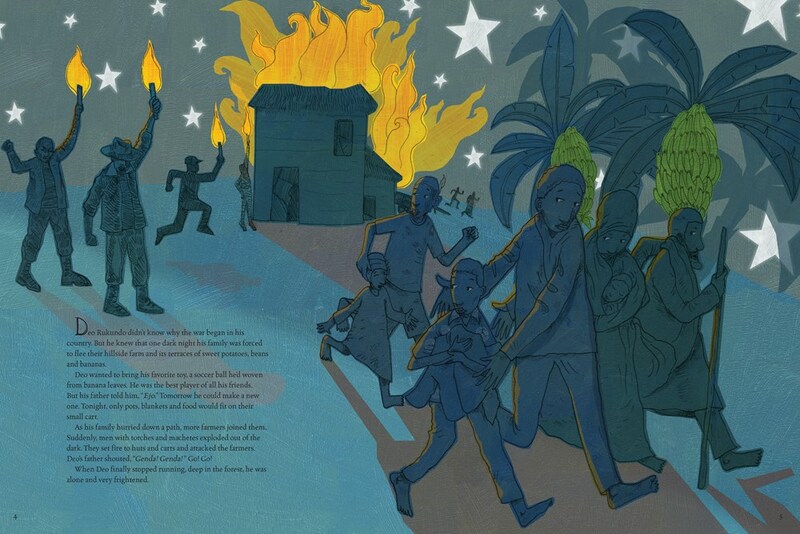 Our students love books that blend lots of images with stories that pull them through. 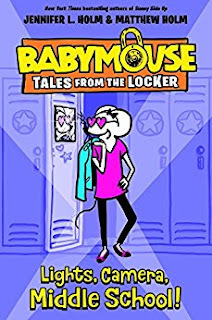 With their knack for laughing through all the challenges that life throws your way, Jenni and Matt Holm bring Babymouse into a new format with Babymouse Tales from the Locker. Seek this out for kids who are ready to move to longer novels, but love graphic novels. As Babymouse heads to middle school, she's worried about whether she'll find friends, what she'll wear and what afterschool activities she'll do. With her great sense of style and leadership, she decides to join the film club and is named director of her group's project. But nothing turns out quite as easy as it seems at first glance. She has to wrangle difficult actors (i.e., friends), make decisions about locations, and make sure everyone's on the same page. Fans of Babymouse will find the same blend of fantasy and school life, but kids new to the series will have no problem fitting right in from the get go. While this is set in middle school, the sweet spot will be with 4th graders who are looking ahead a few years as they figure out the changing landscape of friendships. 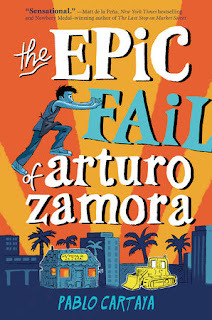 Like a great Cuban meal, Arturo Zamora is smooth, courageous and passionate, with just a little sass to let you know you can't push him around. This debut novel from Pablo Cartaya excels as a layered portrait of a young teen standing up for his family, discovering his passions for social justice and finding the courage to tell a girl that he really likes her. "I'm officially resigning from love. Time in a cell will do that to a kid. For the record: I didn't do it. Well, I didn't mean for what I did to blow up in my face. This should have been the best night of my l ife. I was going to save the restaurant. Save the town. Get the girl. Make Abuela proud... Instead I'm locked in a small room that smells like chorizo and stale popcorn while my archenemy continues to brainwash the community with reggaeton and free sunscreen." "Reading it was like being enfolded into Abuela's warm hug. It was like meeting a family for the first time but feeling like I've know them forever. Arturo's voice is earnest and awkward and at times, hilarious but always genuine." The review copy was kindly sent by the publishers, Penguin Random House and Listening Library, and I have already purchased several more copies. If you make a purchase using the Amazon links on this site, a small portion goes to Great Kid Books. Thank you for your support. I want to find ways to talk with children about what it means that all people are created equal, that all people not only have the right to freedom but also the right to pursue their dreams. And that we must do so while respecting everyone else's rights. 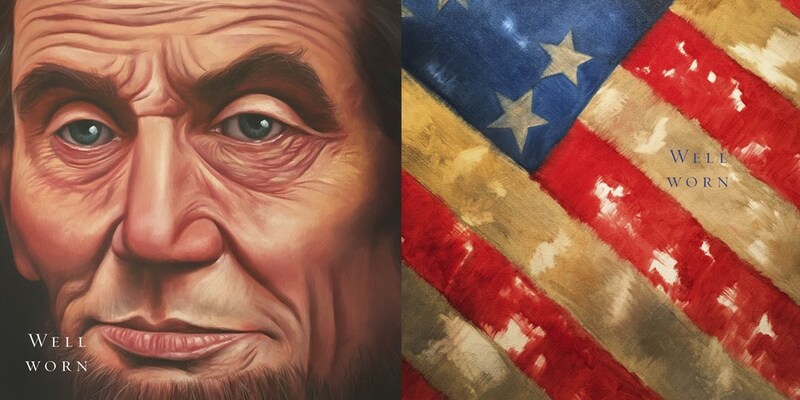 Inspiring paintings complement spare text perfectly, creating a stirring portrait of America. 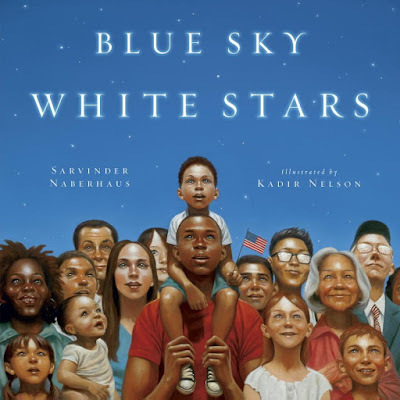 Naberhaus, an Indian American immigrant, and Nelson, an African American illustrator, begin with iconic images of our country, showing how elements of the American flag resonate today. 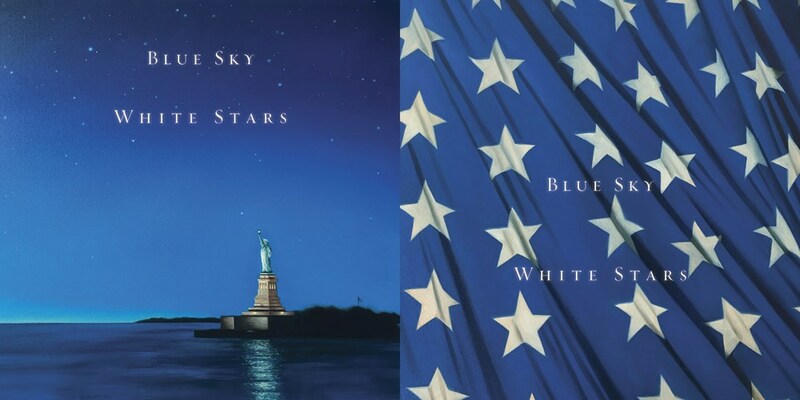 "Blue Sky / White Stars"
Paired images make clear associations between America's values and the diversity of our people, honoring all who have helped shaped our country. 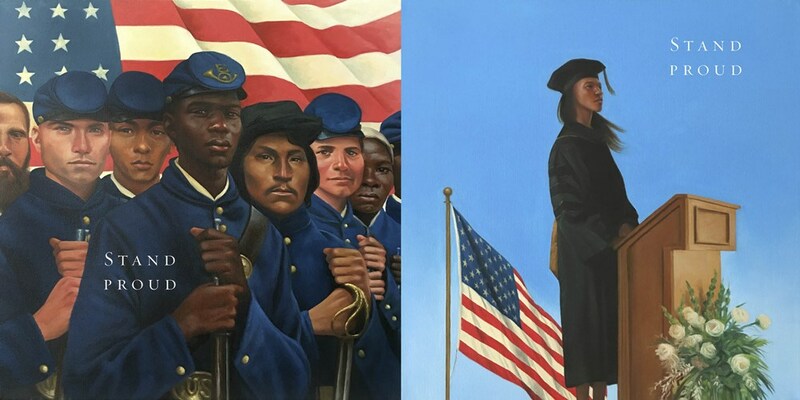 The layered meanings of the text and images will lead to interesting conversations--about why the artist chose these images, and how they show our country changing and evolving. 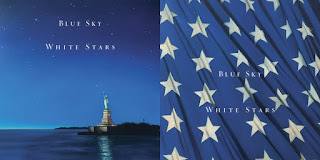 Sarvinder Naberhaus has put together a wonderful collection of resources to complement this beautiful book: Blue Sky White Stars website. Teachers will especially enjoy using this to deepen conversations with students. 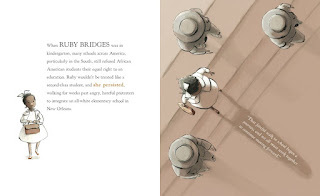 I especially appreciate this beautiful book's message of unity and diversity, together as one country. 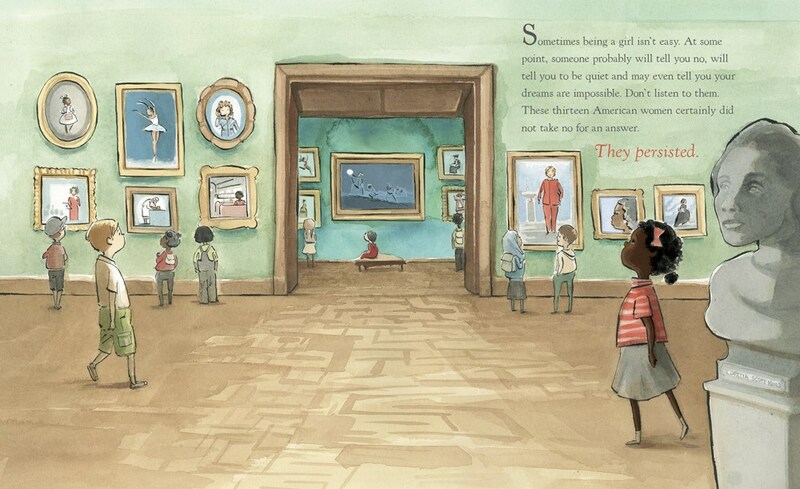 Chelsea Clinton's picture book is definitely building on the momentum of the current political climate, but it also captures an important value for this generation--encapsulating what it means to be a feminist. "Sometimes being a girl isn't easy. At some point, someone will probably tell you no, will tell you to be quiet and may even tell you your dreams are impossible. Don't listen to them." 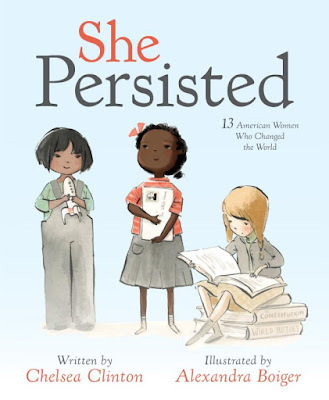 Inspired by Senator Elizabeth Warren's stand against the appointment of Sen. Jeff Sessions as U.S. attorney general, Clinton uses the word "persisted" as she describes the contributions of 13 American women who stood up for change. 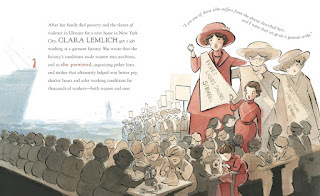 The selection ranges from familiar icons, such as Harriet Tubman and Helen Keller, to lesser known leaders such as union organizer Clara Lemlich and physician Virginia Apgar. 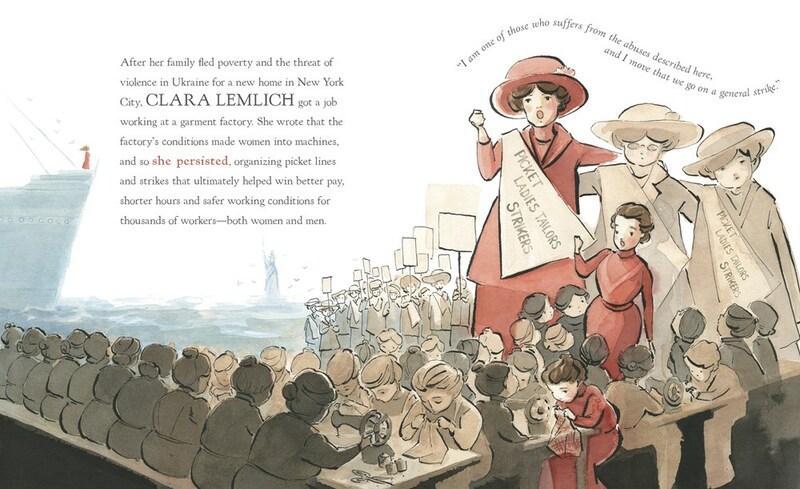 "Clara Lemlich...wrote that the factory's conditions made women into machines, and so she persisted, organizing picket lines and strikes that ultimately helped win better pay, shorter hours and safer working conditions"
The real value of this book will come from conversations it might lead to, about these different women. Clinton limits her descriptions to two sentences, just touching on some of each woman's achievements. While some critics say that this makes the broad strokes ineffective (see this Kirkus review), I would argue that it allows the conversation to develop between the child and adult. I do wish that Clinton included an author's note and some sources for further reading, precisely because this might help guide an adult and child who might want to learn more to talk more deeply. 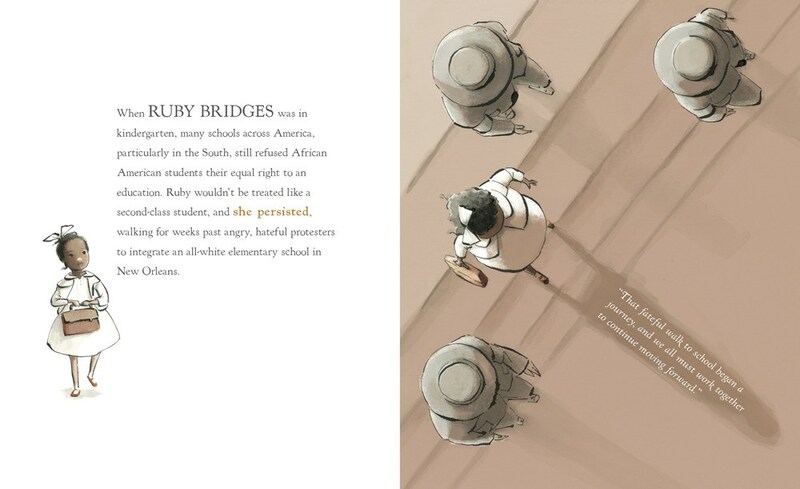 "Ruby Bridges... wouldn't be treated like a second-class student, and she persisted, walking for weeks past angry, hateful protesters to integrate an all-white elementary school"
I am struck by how the history books I read as a student ignored so many of these women. Only two of the thirteen were mentioned in my schooling. This is precisely why this is an important book to share with our young readers--to foster these conversations, so young readers will want to learn more. 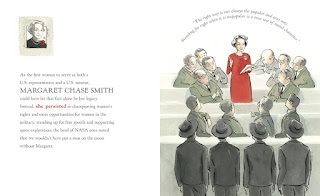 "As the first woman to serve as both a U.S. representative and a U.S. senator, Margaret Chase Smith could have let that fact alone be her legacy. Instead, she persisted in championing women's rights and more opportunities for women in the military, standing up for free speech and supporting space exploration." Illustrations © Kadir Nelson 2017, and illustrations © Alexandra Boiger 2017, shared with permission from the publisher. The review copies were kindly sent by the publisher, Penguin Random House. 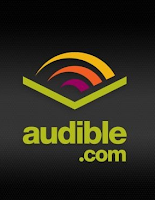 If you make a purchase using the Amazon links on this site, a small portion goes to Great Kid Books. Thank you for your support.